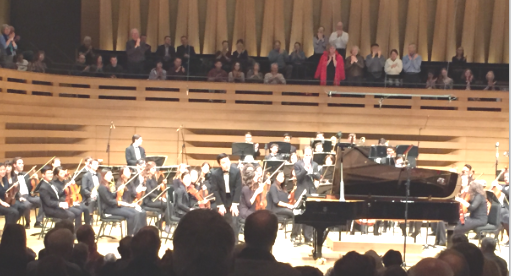 Flying under the radar of Toronto’s concert scene is the Royal Conservatory Orchestra. Made up of students in the Conservatory’s Glenn Gould School, it is a musical gem that presents four concerts each academic year in the wonderful acoustics of Koerner Hall. The orchestra is led by a different guest conductor for each concert who spends a week in residence at the school prior to each performance rehearsing the orchestra. Without the time constraints of most professional ensembles, the orchestra’s preparation is done with meticulous care. Before each concert, as a bonus, ticket holders can come early to hear a Prelude Recital in Koerner Hall by the school’s superb chamber ensembles. Last night’s performance presented two staples of the orchestral repertoire, Tchaikovsky’s Piano Concerto #1 and Rimsky-Korsakov’s Scheherazade. Johannes Debus, Music Director of the Canadian Opera Company conducted. He delivered a spirited performance of both works giving great attention to the details of balance, tempi, and dramatic moments. Edward Zhou, pianist for the Tchaikovsky, gave a powerful performance. He handled the impossible technical demands with utmost security and created magic in the tender passages with a wonderful sense of musical phrase. Zhou, in his final year of studies at The Glenn Gould School, is a Vancouver native who has twice performed with the Vancouver Symphony. The Rimsky Korsakov work was a showcase for the virtuosity of various orchestra members. As a piece of programme music, it musically told the tale of Scheherazade who saved her life and love by keeping the Sultan awake all night for 1000 nights following their wedding, telling him stories ‘till dawn. Alexis Hatch, the concert master for this performance gave a sparkling rendering of Scheherazade the bride. Other notable soloists included Bee Unger, bassoon, James Churchill, ‘cello, and Emily Phernambucq, flute. The next performance of the Royal Conservatory Orchestra will be Friday April 8th, 2016 8pm at Koerner Hall. Leon Fleisher will conduct. Wanted to quickly correct an error: the fantastic bassoonist was Bee Ungar (not Dee, as printed).